Art, Method, Sales and a "J"
I replied to her that we know that pattern drawing has existed throughout history in many (all?) cultures​ and in different mediums. However, we developed the Zentangle Method as an easy-to-learn and fun way for almost anyone to enjoy this artform . . . people who may not have knowledge of it or know how to go about drawing in this manner. In writing my letter to her, something occurred to me that I had not thought of before. We have given them away, donated them to non-profits (that may have sold them), traded a few, but in all the exhibits and gallery presentations, we just put them out there for people to get familiar with the art form. 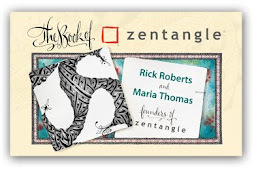 While we do market tools so others can create Zentangle art, and seminars so others can teach this art, it just struck me this morning as fascinating that neither of us have ever sold any of our original Zentangle tiles. We feel that Zentangle is unique in terms of art. Rather like yoga, meditation, or contemplative stillness . . . there are no blue ribbons, no critiques or bad practitioners . . . a personal art . . . to have, to hold, to appreciate, to be grateful for . . . and a community of artists . . . to admire, to encourage, to share with and to learn from, and again, to be grateful for. So, I wonder what made it different than all my other artistic endeavors. I had no problem selling those. When I began keeping bees about 7 or 8 years ago, I had the idea of selling honey. I still keep bees and I love it. But now I don't sell the honey. We enjoy it as a family and now we share the rest. Maybe there's a parallel since our tangling and my keeping bees are both labors of love and not what we depend on for income. We love that other people sell honey. 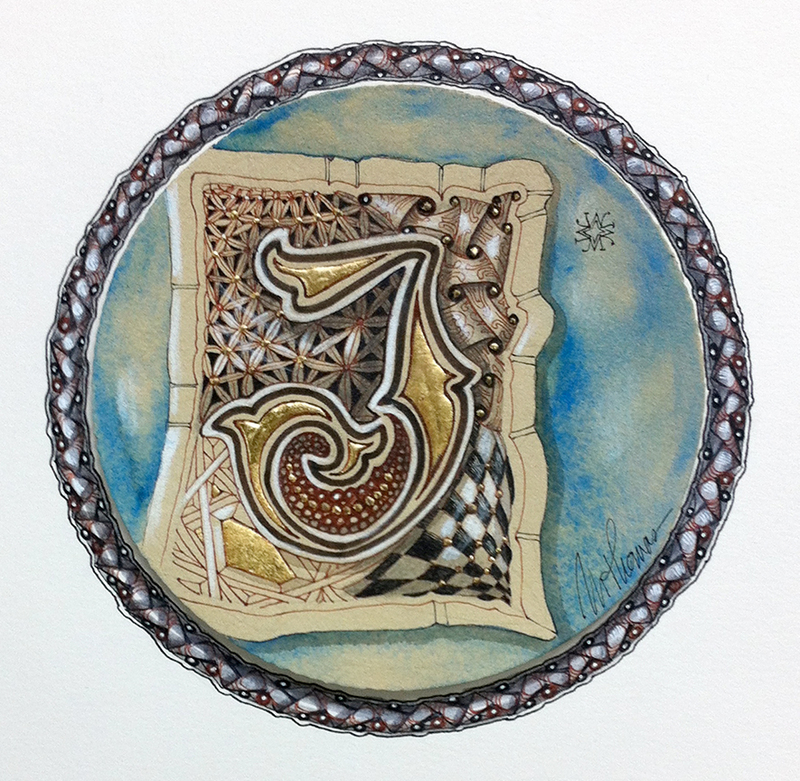 We love that other people enjoy selling their Zentangle art. It just seemed so bizarre that we had never thought about this until now, so many years later. Roslyn, please email your snail mail address to zentangle (at) gmail (dot) com. Oh, yeah and just for a bit of eye candy . . . here's a piece I did for my grand-nephew who just graduated high school. He was also the youngest CZT for a while. 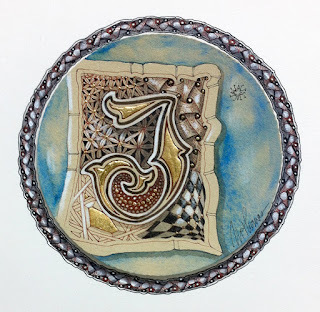 I used the classic (letter in a box) format for an illuminated letter, but thought a creative young guy like Joe would appreciate something unexpected, a bit quirky, not so heavy. I did this on a Renaissance Zendala and mounted it on a cream paper on which I tangled a border. I used Micron black and brown inks, graphite pencil, white charcoal pencil, a white Sakura Gelly Roll pen, 24k gold leaf and a watery blue gouache. I held it out, turned it this way and that, and decided I liked it . . . enough to give it away.